Through the past 8 years, volunteers have come and gone for various reasons. Every one of them however has contributed their time and heart with one single goal in mind: Helping ferrets. These beautiful misunderstood creatures that through no fault of their own find themselves in need of rehoming and medical assistance. At this time the rescue is run by myself and Caroline Yingling. She has been by my side from day one and I can count on her day and night for anything we need. We couldn't make it without the support of each other and the strength and courage that get us through the abuse and neglect we are sometimes forced to witness. Rescue sometimes seems like an assembly line of heartbreak after awhile, an emotional roller coaster that you could never prepare for. It becomes so frustrating to continue helping one ferret after the next and deal with death and passing. After helping a needy animal out of a horrible situation into the life they deserve only to see them pass away. ..sometimes soon after the healing has begun. It takes an incredible amount of stamina and courage to press on. The average person knows the feelings of grief and loss of an animal companion maybe once every 10-15 years (average life of a dog or cat). Under the best circumstances a ferret lives 6-10 years maximum but most ferrets are not fortunate enough to have the very best which can decrease that life expectancy considerably. Add to those odds all the illnesses that they are prone to, the emotional and physical neglect and abuse some have already endured and the life expectancy can reduce significantly more, sometimes to the age of 4-5 years. Aside for my deep love of animals, I believe that part of the reason I am in rescue is a greater calling to learn how to deal with grief and passing. Those affiliated with the rescue are here for each other through the good and bad, the laughter, dooks and wardances as well as the tears and grief. We share each joy and grief as if it were our own. As a rescue team, we are also a second family for each other and something to be valued in what often seems a very cold and uncaring world. It wasn't long after we bought our first two ferrets that I began to rescue. I've helped stray animals since I was a child but the big inspiration to start a rescue organization goes to Gypsy and Tip. I fostered these two ferrets from another organization who had them tagged as "unadoptable". I was infuriated by this terminology. There are people with special places in their heart for the special needs ferrets. I took them in to learn more about their illnesses, to try and assist them with herbal formulas and to learn how to deal with passing. Soon after, Somethin Up My Sleeve Rescue was born. I love everything about ferrets, their intelligence and ability to overcome obstacles is something to be admired. They are such entertaining and unique creatures! 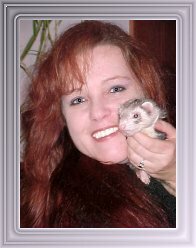 It was, after all, the love of a ferret that awakened my ability to communicate telepathically with animals. Rescue has been a rewarding experience in so many ways. I've developed close relationships with women, something I never thought possible, sharing the same vision without self serving egos or politics, "to rescue, rehab and rehome"...to help ferrets in need.